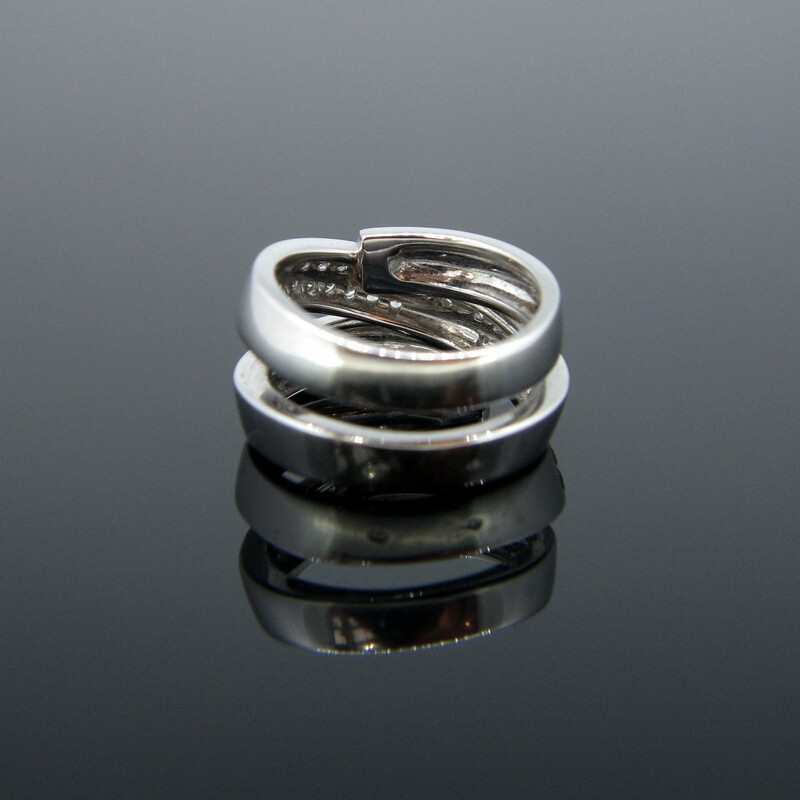 This beautiful contemporary ring is fully made in 18kt white gold. It is marked with the eagle’s head. It is set with 31 round brilliant cut diamonds in a paved setting. The total diamond carat weight is 0.45ct approximately. It has great design and perfect to wear everyday. 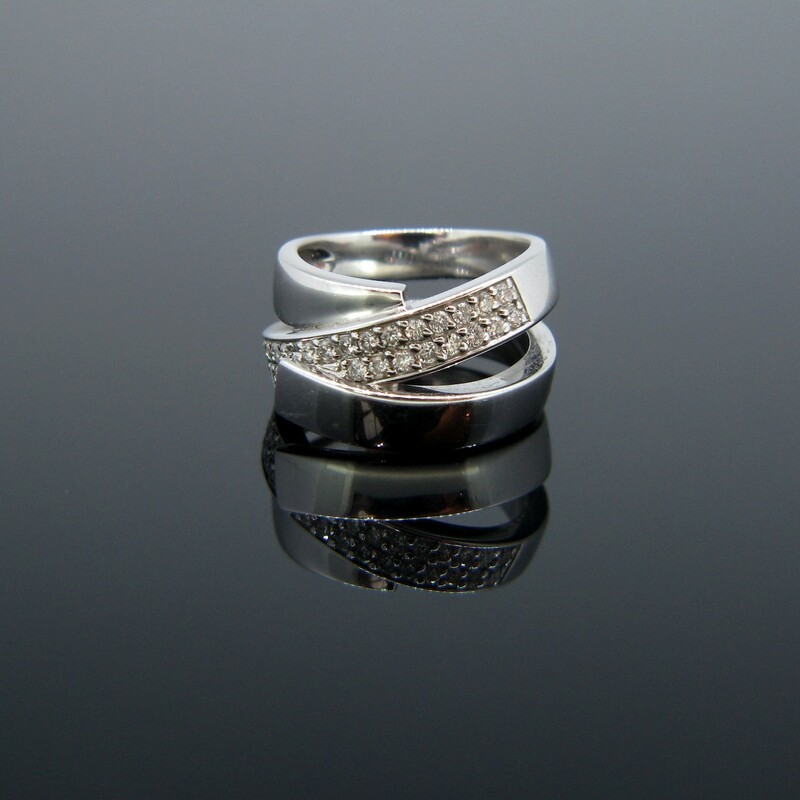 This ring can be resized if needed (don’t hesitate to enquire). 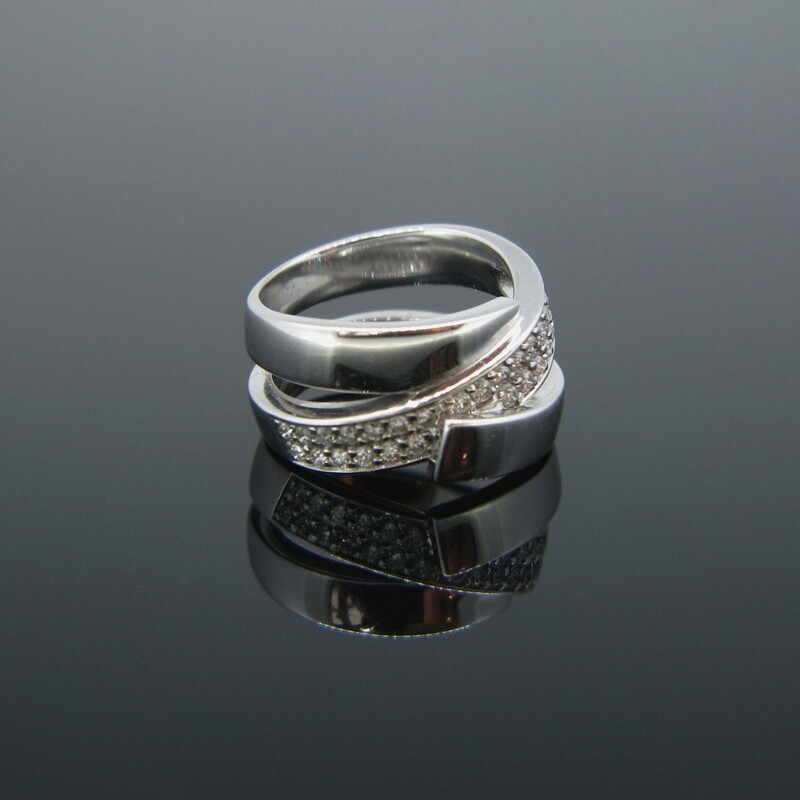 • Total Carat Weight: 0.45ct approx. This elegant contemporary ring is made in 18kt yellow gold; it is set with a round brilliant cut weighing around 0.30ct and is shouldered with two lines of 6 emerald cut diamonds (three on each side) with a total carat weight of approximately 0.45ct. It is then underlined by 20 calibrated rubies in total. It is signed by a French jeweller named Aldebert and is numbered 101886. 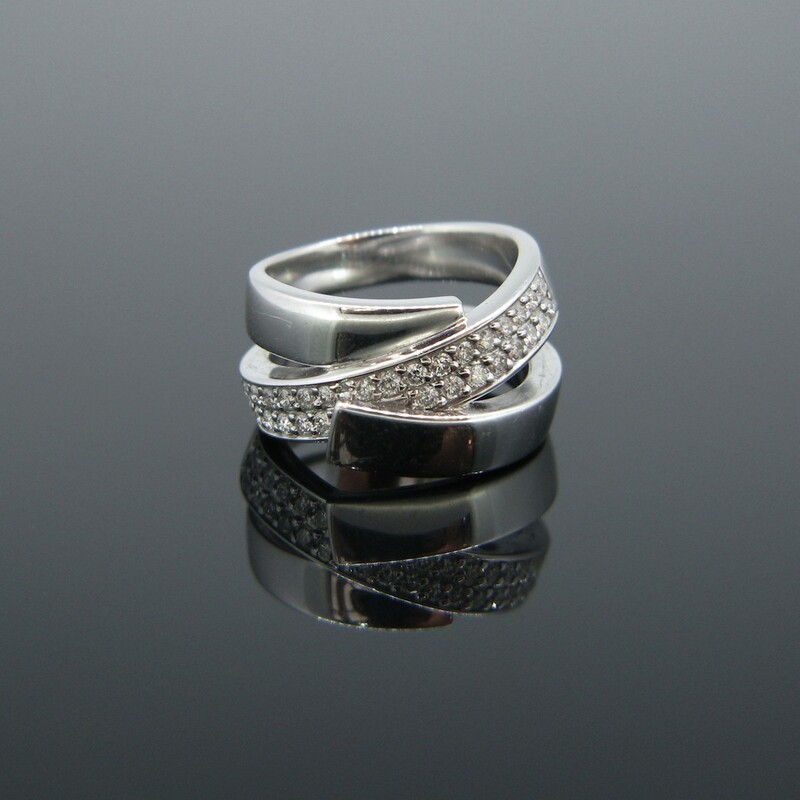 It is a very attractive ring to wear every day. All our items come with either a gemmological report or a jewellery report with circa and all useful information. Heritagem presents: This ring is made in 18kt white gold. It has a lovely geometric design and it is perfectly shape for the finger. 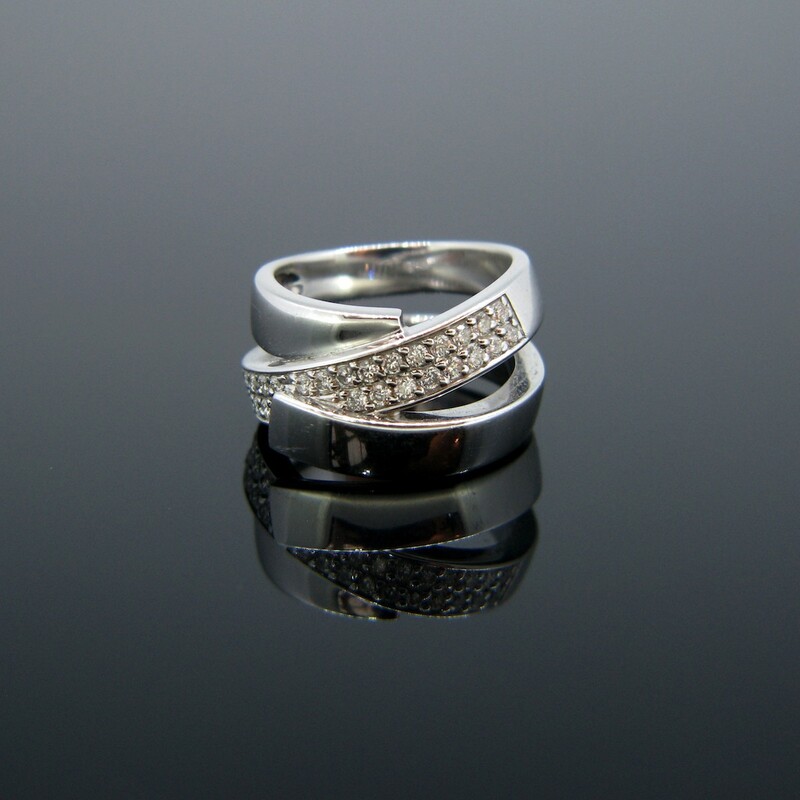 The top is beautifully set with brilliant cut diamonds into three different parts. The diamonds are around 1,40ct and they have a color H with a clarity VS. The diamonds are lively and sparkly. The ring weighs 7,2 gr and it sizes 53,5 (6,5). It is easily resizable, feel free to ask we will be happy to do it for you (included into the price). it was controlled with the UK hallmark for 18kt gold. 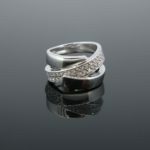 This ring could be the perfect give to propose or just to celebrate your love ! All our items come with either a gemological report or a jewellery report with circa and all useful information. Heritagem presents : A unique Modern ring set with a Watermelon Tourmaline. The ring is set in its center with a bicolor tourmaline that we usually call a Watermelon. Because it goes green to pink like the inside of the watermelon. Easy to guess, right ? This one weighs around 3,50ct. It is framed with 18kt yellow gold. The ring is enhanced with 14 brilliant cut diamonds (tcw : 0,20ct approximately). This ring is ravishing and very easy to wear for everyday. It was controlled with the traditional UK hallmarks. Heritagem presents : This ring is made in platinum. It features in its center a Flanders cut diamond weighing approximately 1,60ct (color : H / clarity : VS). The shoulders of the ring are adorned with 58 brilliant cut diamonds with an approximate weight of 1,30ct. The mount is just ravishing : it is geometric and airy, it lets the light go through the diamond. This ring is the perfect present for your fiancee, it is a timeless design and very trendy ! Is there a better way to say your love with a solitaire ring ? 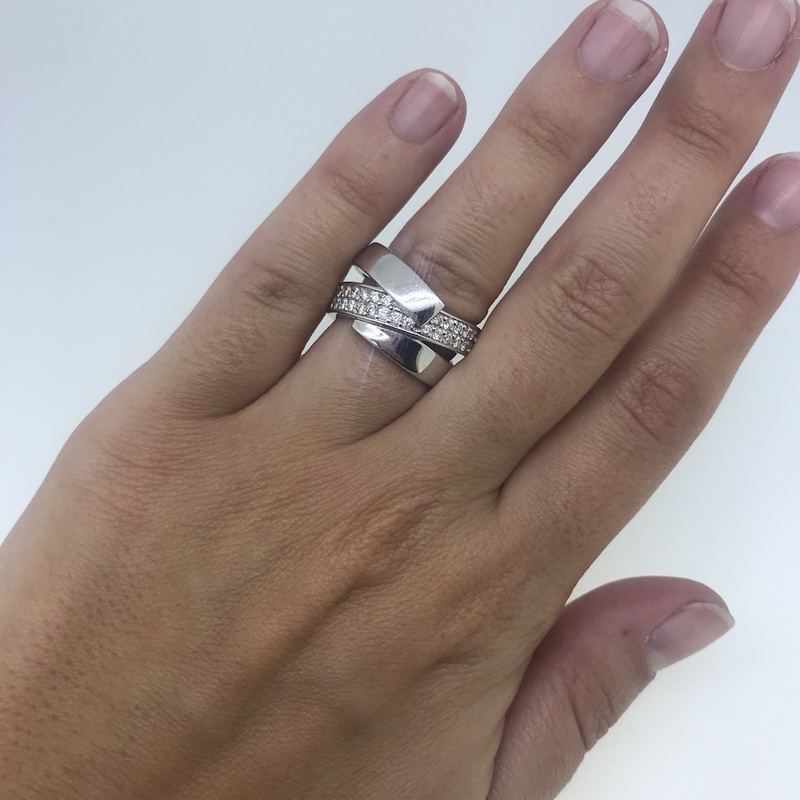 Heritagem presents: This modern ring is made in 18k white gold and features a rectangular cut Ceylan sapphire with a weight of 2.25ct and no indication of heating. It is surrounded with 34 diamonds for a total approximate weight of 0.30ct It is a beautiful stone set in a simple yet sophisticated mount. It comes with a GCS certificate number 5774-530. 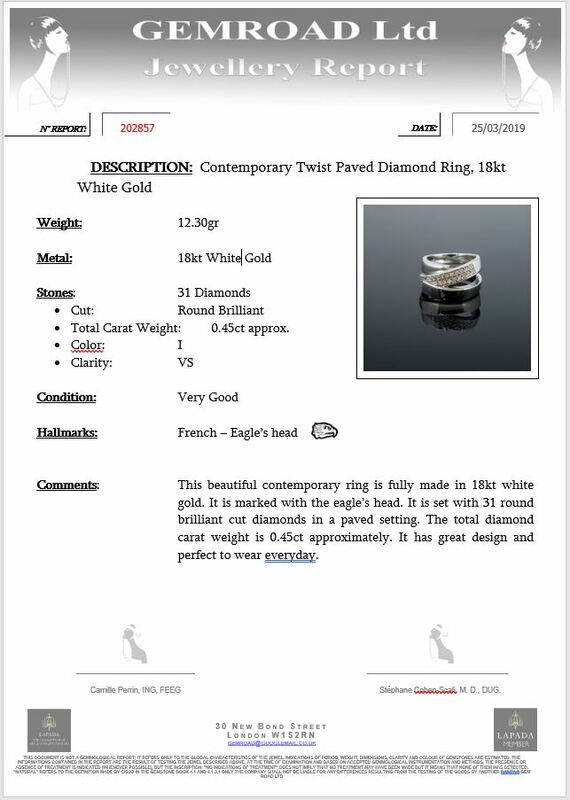 All our items come with either a gemmological report or a jewellery report with circa and all useful information. Heritagem presents : This ring is made in 18kt white gold. It is set with 6 brilliant cut diamonds for an approximate total carat weight of 0,50ct (color H / Clarity VS). The ring is very modern and very pleasant to wear. The gold is smooth and shiny. The design is quite unusual and eye catching.It weighs 15,9gr and it sizes 55 / (US). It could be easily resizable. Feel free to ask we will be happy to do it for you (included into the price). It is controlled with the French Eagle's head for 18kt gold and there is also the maker's mark but it is quite hard to read. 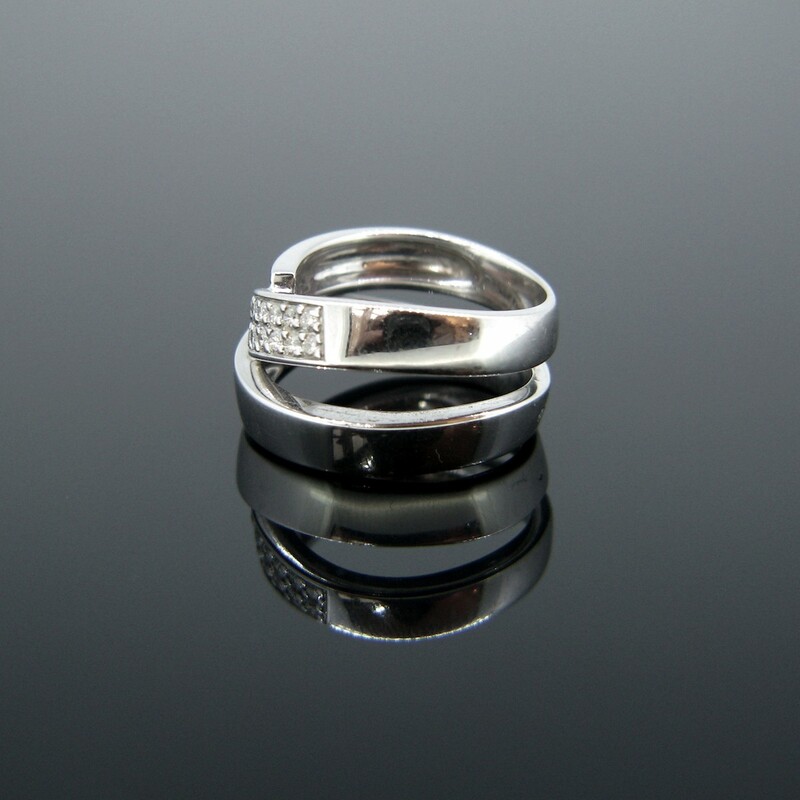 The ring presents few traces of wears at the back, otherwise it is in good vintage condition, you will to wear it ! All our items come with either a gemological report or a jewellery report with circa and all useful information. Heritagem presents : a Stunning Bombé Diamonds ring. 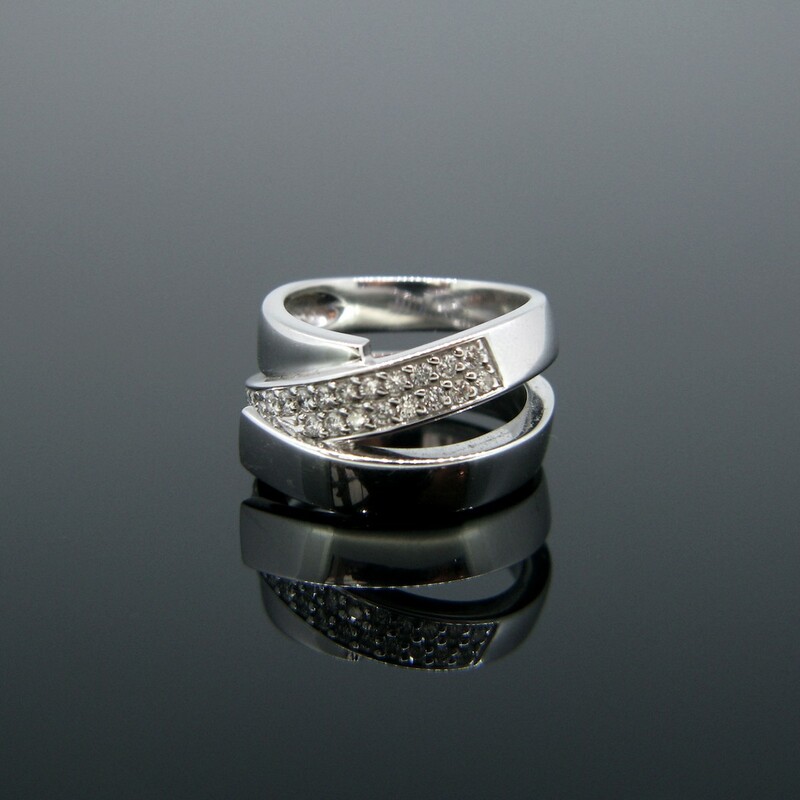 This ring presents a beautiful Pave set diamonds. Those ones are set with a technic we call le "Serti Mysterieux", the mysterious setting. As we can't see the prongs we might wonder how the diamonds are fixed on the mount. They are actually set on rails and thanks to this setting it gives a beautiful design to the ring. They are 55 diamonds for a total carat weight of 4,45ct. They have a H color and a VS clarity. The ring was perfectly handcrafted. It is marked with the French Owl for 18kt gold. It was also engraved 750 and D445 inside the ring band. 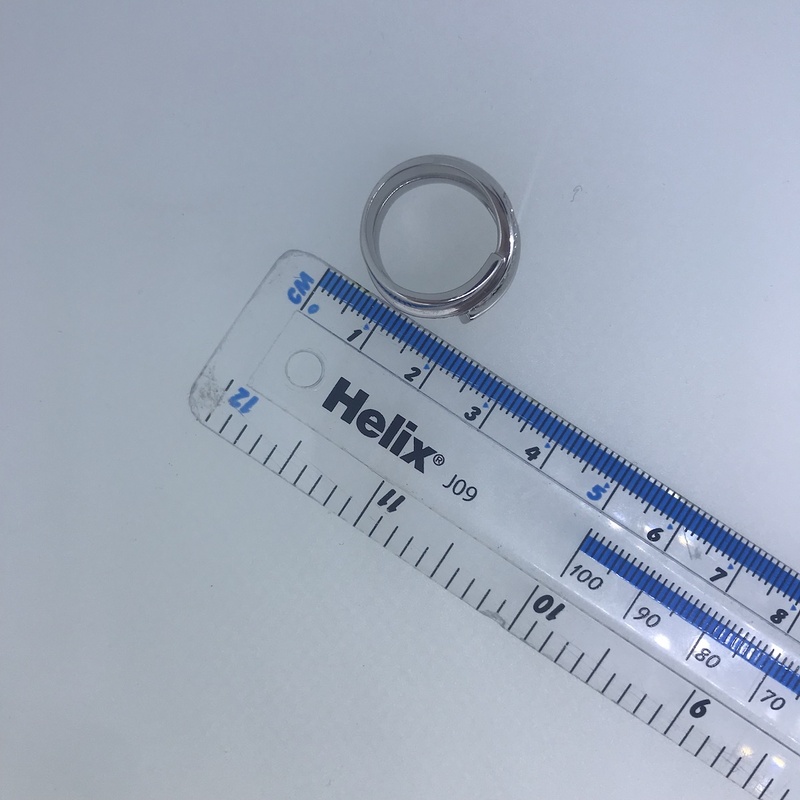 The ring is sized 5,75 / 51,5. This bold and impressive ring features an incredible 40 carat cabochon cut aquamarine. The aquamarine is set within a nest of 42 leaves motifs with diamonds. There are 141 diamonds set all around the aquamarine on the leaves. The band is made in ribbed textured 18kt yellow gold. All our items come with either a gemmological report or a jewellery report with circa and all useful information. Heritagem presents : This beautiful modern ring features a round brilliant cut diamond of approximately 0.40ct. It is unusually surrounded by a chain – very unique design. 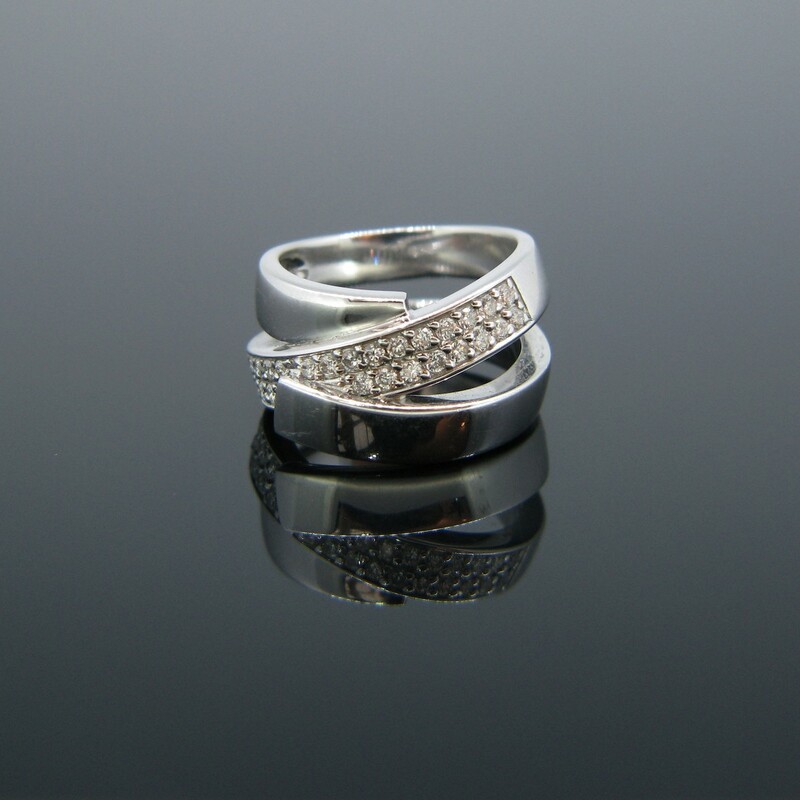 The band is made in 18kt white gold. This ring can be resized if needed (free of charge). Heritagem presents : An original black diamonds ring. This one is made in 18kt black gold and it is entirely paved with brilliant cut black diamonds. It has a strong modern design. It was made by the designer JOC. The back of the marble was engraved with the signature JOC and with the weight of the diamonds : 4.20ct. The shoulders of the ring was engraved with the name Amanda. This ring is sparkly and very original. This modern ring is made in 18k white gold and features a cushion cut Ceylan sapphire with a weight of 1.44ct and no indication of heating. It is surrounded by 24 small diamonds with an approximate total carat weight of 0.20ct. It is a beautiful stone set in a simple yet sophisticated mount. It comes with a GSC certificate number 5774-538. All our items come with either a gemmological report or a jewellery report with circa and all useful information. Heritagem presents: This ring is made in 18kt white gold. It has a lovely geometric design and it is perfectly shape for the finger. The top is beautifully set with 3 lines of brilliant cut diamonds. There are 21 diamonds and they are around 0,25ct and they have a color H with a clarity VS. The diamonds are lively and sparkly. 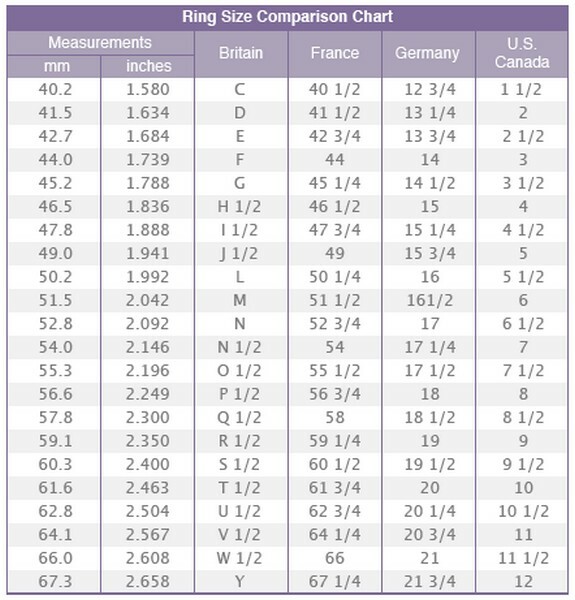 The ring weighs 10,3 gr and it sizes 50,5 (5,25). It is easily resizable, feel free to ask we will be happy to do it for you (included into the price). It was controlled with the French hallmark for 18kt gold the eagle's head. Heritagem presents : A ravishing Diamonds ring. This ring is so lovely ! It is set in its center with a brilliant cut diamond weighing 0,40ct with a color E and a SI2 clarity. It is shouldered with 2 pear cut diamonds. The mount is very refined. The gold is smooth and shiny. They are barely few traces of wears and it is in very good condition. This ring is the perfect engagement ring !